Digestion and elimination problems are the #1 reason for most doctors visits. 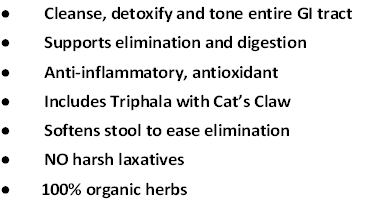 Herbal Colon Health with Cat's Claw is a unique blend of 100% organic herbs traditionally used to support elimination and digestion and for optimal health. It helps cleanse and tone the entire Gastointestinal tract . Triphala and Cat's Claw make up this unique formulation. Triphala is a combination of three herbal fruits used for thousands of years. It is the most widely used colon health herbal remedy in Ayervedic medicine, originally from India but is widely practiced throughout the world. Due to the Standard American Diet, or SAD, for short, it could well become even more important here in America and is recommended by such experts as Dr. Andrew Weil and Deepak Chopra. For additional support, we add Cat's Claw to help reduce inflammation, tone, balance and detoxify the colon. Good health really depends on optimal elimination. A sluggish colon puts extra stress on all parts of the body and can result in bowel diseases such as IBS (Irritable Bowel Syndrome) or ulcerative colitis, low energy, a compromised immune system, headaches, skin or joint problems, and general toxicity. Slow transit times in the colon translates to possible toxic back-up which increases the potential for disease. If your diet is not always the greatest or you're not having a minimum of one easy bowel movement daily, you could be compromising your health. Natural remedies are the best approach for a healthy colon. Suggested Usage: As a dietary supplement, take 1-2 capsules 1-2 times daily after or between meals or at bedtime. Do not take if pregnant or experiencing diarrhea.